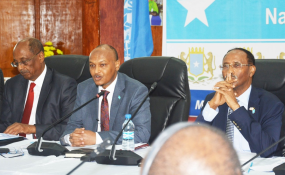 The Deputy Prime Minister of Somalia, Mahdi Mohamed Guled, gives opening remarks at the National Economic Policy Forum, with (l) the Executive Director of the National Economic Council (NEC), Dr. Ali Isse Abdi, and (r), Dr. Abdirahman Dualeh Beileh, Federal Minister of Finance, Mogadishu, 13 November 2018. Somalia has hosted its first high level National Economic Policy Forum this week in Mogadishu, which saw participants discuss a national investment strategy, financial governance, tackling corruption and how to enhance regional economic cooperation with other East African countries. Copyright © 2018 United Nations Development Programme. All rights reserved. Distributed by AllAfrica Global Media (allAfrica.com). To contact the copyright holder directly for corrections — or for permission to republish or make other authorized use of this material, click here.